We’ve all been there; you leave a few apple slices out too long or take too long to eat your way around an apple, and you’re confronted with an unpleasant sight. Your once crispy, juicy white apple has turned a dismal shade of brown. I’ll show what causes it and how to stop it from turning brown. Things you’ll need: An apple, a knife, salt water, vinegar, tap water, and 3 cups. Cut the apple into four pieces. Dip the pieces of the apples into salt water, vinegar, tap water, and leave the last piece by itself. 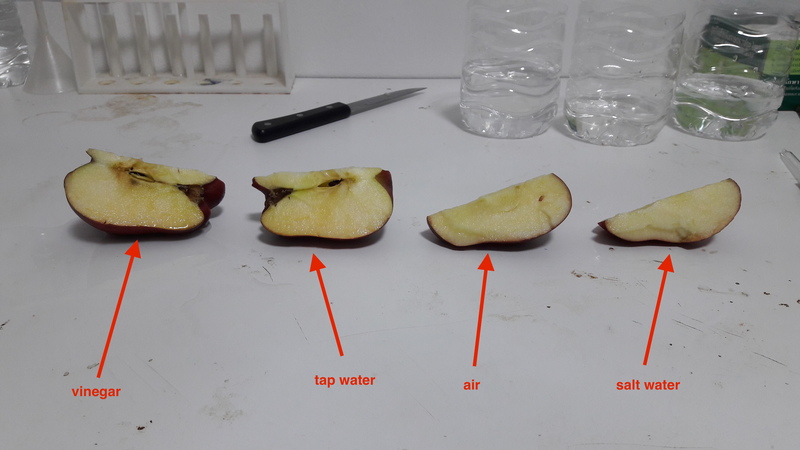 The apple that has been dipped in the vinegar should be the brownest, the apple in tap water should be the second brownest, the apple that is touching air should be the third brownest, and the saltwater piece should be the least brownest. The phenolic compounds work well in PH 5.8 – 6.8 and that why the piece of apple that has vinegar is the brownest and browner than tap water. The way to stop turning it brown is by putting salt water or sugar on it.